Thank you for all of the great feedback last week from our first Wonky Word Wednesday! We’ve been talking a lot lately about Medicaid Expansion in Montana, and how it would benefit people living below 138% of the federal poverty line. But what do we mean when we say that? Where is that line, and where does it come from? To answer that question, we begin with this week’s wonky word: Federal Poverty Line, or FPL for short. Before we begin, I have to be honest. For years I have been confused whether to call it the federal poverty level or the federal poverty line. Doing this research, I learned that although we often talk about people living below the “poverty level,” the federal government refers to “poverty guidelines.” For today’s purposes, we are going to call it the Federal Poverty Line. What exactly is the Federal Poverty Line? Put simply, the poverty line is a threshold used for calculating official poverty statistics and to determine eligibility for certain federal programs. Below the line, a person is officially considered to be living “in poverty.” The current FPL is updated yearly to reflect changes in the cost of living. In 2014, a single person is at 100% of the FPL if he or she makes less than $11,670. For a family of three, the FPL is $19,790. Interestingly, Hawaii and Alaska have a higher poverty line because of the expense to live there. Why do we have it? What is it used for? The FPL determines eligibility for various federal programs, such as Head Start, the Supplemental Nutrition Assistance Program (SNAP), the National School Lunch Program, Special Supplemental Nutrition Program for Women, Infants, and Children (WIC), Job Corps, and the Low-Income Home Energy Assistance Program (LIEAP). Different percentages of the FPL can be used for this calculation. Here’s another example. If Medicaid Expansion were to pass in Montana, people living below 138% of the FPL would qualify for Medicaid health care coverage. That means earning just over $16,000 a year for an individual, or $27,000 a year for a family of three. There are up to 70,000 Montanans who would qualify under that definition. $11,670 doesn’t sound like very much money. How’d they come up with that? The formula we use for poverty thresholds dates back to the 1960s, when it was developed by Mollie Orshansky of the Social Security Administration. She figured food should cost about one-third of a family’s budget, so she multiplied how much the U.S. Department of Agriculture’s economy food plan costs by three to calculate the minimum a family would need to get by. With a few minor changes, these are pretty much the guidelines we follow today. The problem here is food used to make up a much larger percentage of a family’s budget than it does today. Other costs, like child care and education, have risen at an even greater rate so even families living above the poverty line might be struggling to get by. Right now there are 152,000 people living below the FPL in Montana, over 15% of the population. 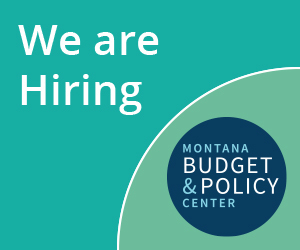 The Montana Budget and Policy Center is continuing to research ways to help Montana families improve their quality of life and rise above this line. Some of these ways include expanding Medicaid, providing state funding for pre-K, and improving the lives of American Indians in Montana. I hope you will check back each Wednesday for more wonky words. If you have suggestions, comment below, email me at tjensen@montanabudget.org or post something to our Facebook page.